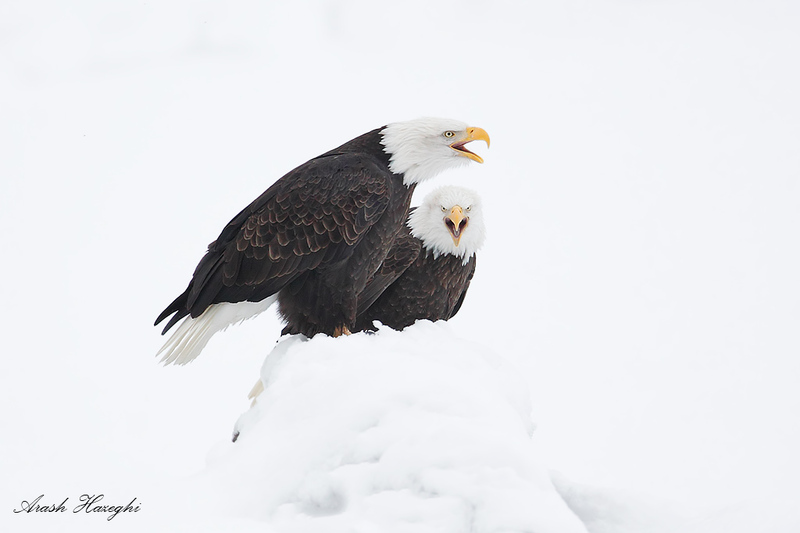 Bald eagles, a trip to Haines, AK. 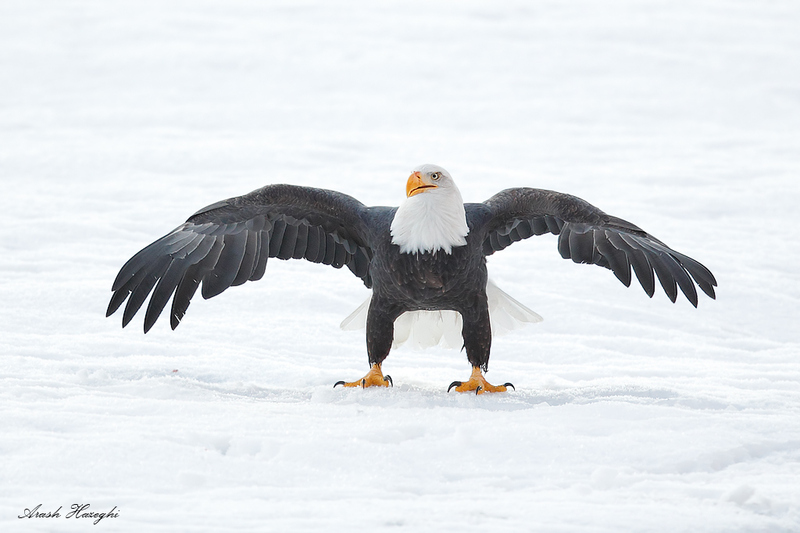 Earlier this month I flew to Alaska to photograph bald eagles with my friend Jim Neiger, like myself Jim specializes in handhold flight photography and this was a new location and opportunity for both of us. We flew to Juneau, AK. From there we took the ferry to the small town of Haines (population about 1800). It was pretty cold up there and with the tourist season now over, there were few options for dining/entertainment so we spent most of our relatively short daylight hours with the eagles. View of Chilkat river valley in Alaska Chilkat Bald Eagle Preserve, AK. Click to here view the full resolution panorama (very large file). ©2012 Arash Hazeghi, all rights reserved. We spent the first afternoon scouting, finding the spots which appeared to have the best angles, backgrounds and a higher chance of activity. 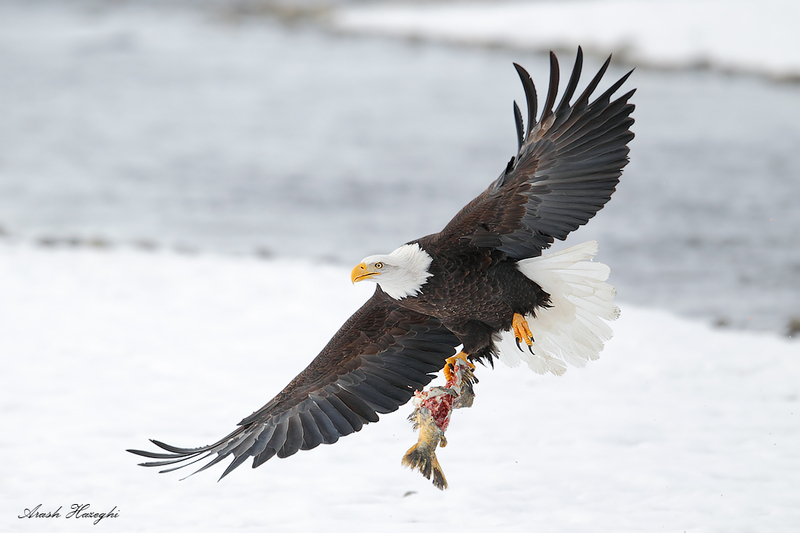 The eagles prey on salmon in shallow water by dragging them to the river bank. The locations where the river becomes shallow and narrow are best since most salmon seem to converge and then get stock in shallow waters. We saw eagles mostly dragged dead and dying fish which require least amount of effort! It was overcast with mild rain which turned into heavier snow further down highway 7 towards the Canadian border. 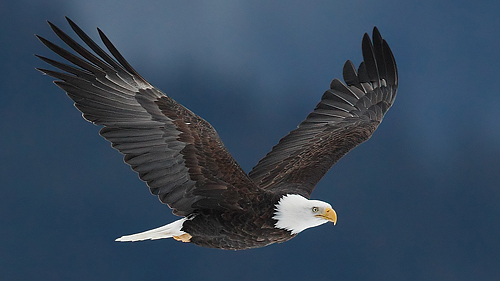 The overcast conditions are ideal for photographing eagles. In direct sunlight is is difficult to maintain great detail in both head whites (which is a pure white for adult birds) and the dark plumage. Furthermore, the road is located north of the river through most of the preserve this means you will be shooting against the sun if the skies are clear, it can ruin the entire shoot. Fortunately the chances of having overcast skies is much higher than clear skies during this time of the year. It is quite impressive to see an eagle up close for the first time. Thanks to plenty of salmon in the river, most eagles looked fat and happy! There were occasional skirmishes with gulls and crows but most action was later in the afternoon when the eagles would buzz each other. It is easier for larger birds to just bully the juveniles and smaller birds in order to grab their salmon as opposed to drag one out of the river. This lead to some spectacular scenes at times. Adult bald eagle with salmon. EOS 1D4 600mm f/4.5 1/2000sec ISO 800 handheld. Click here to see an HD image. ©2012 Arash Hazeghi, all rights reserved. Bald eagles calling. 1D4 840mm f/5.6 1/1250sec ISO 1600 handheld. ©2012 Arash Hazeghi, all rights reserved. There were plenty of seagulls, magpies and crows waiting for their opportunity to grab a bite off the fresh and sometimes frozen salmon. They were quite aggressive although they would bail out quickly once the eagles were agitated too much. I workout! Bald eagle displaying her might to command respect from crows and gulls. 1D4 600mm f/4 1/1600sec ISO 1600 handheld. ©2012 Arash Hazeghi, all rights reserved. 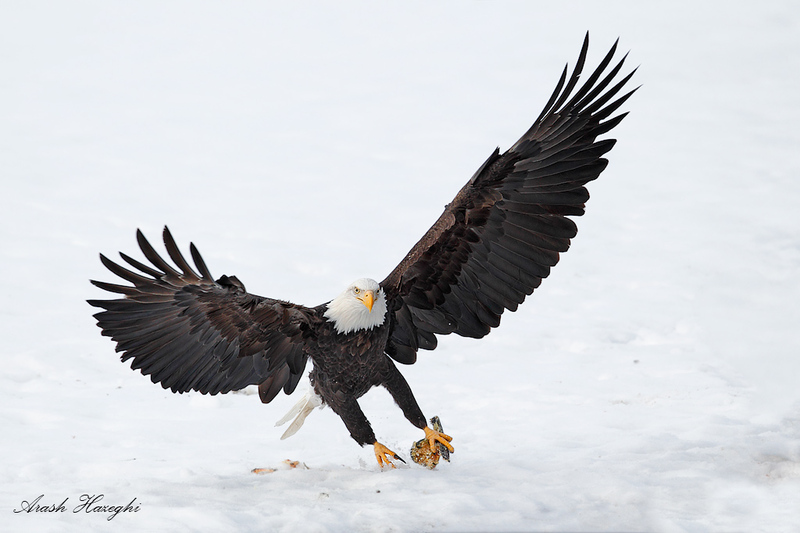 Sometimes the eagles would grab and fly off with salmon leftovers, taking them to the trees where they can snack without having to deal with the scavengers. Bald eagle taking off with his prize. 1D4 600mm ISO 800 1/2000sec f/5 handheld. Click here for an HD file. ©2012 Arash Hazeghi, all rights reserved. Most salmon were quite large, perhaps more than 8 lbs. We saw eagles fly with parts of fish and leftovers only. 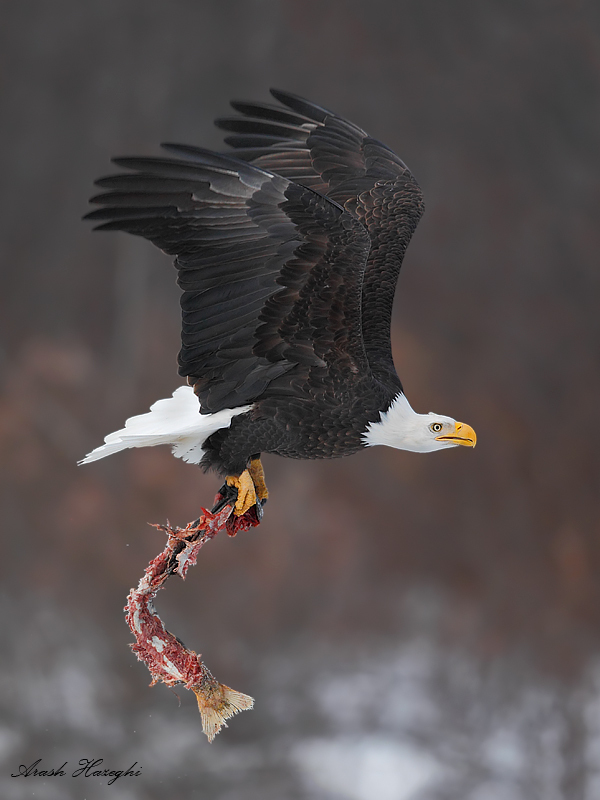 Bald eagle with salmon piece. 1D4 600mm f/4.5 1/2000sec ISO 800 handheld. Click here to see an HD file. ©2012 Arash Hazeghi, all rights reserved. 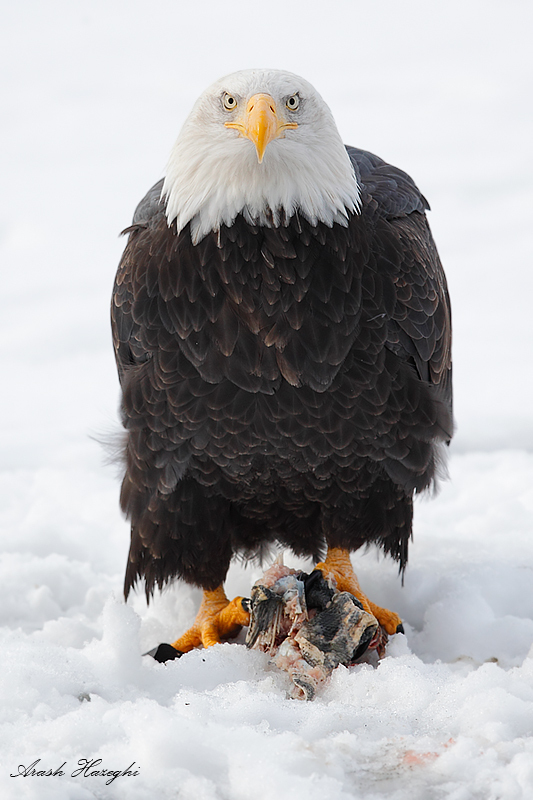 Bald eagle with salmon leftover. 1D4 600mm f/4 1/1600sec ISO 640 handheld. Click here to see an HD file. ©2012 Arash Hazeghi, all rights reserved. I am going to photograph the eagles at Haines in November, 2013, and these pages were very helpful in showing me what it is like and how to shoot the eagles. Your tips will come in very handy. Excellent write-up and fantastic images Arash! What a great experience you had at Haines with the eagles Arash – I’m most envious!! Thanks for sharing your techniques and images. Very nice article, and excellent images as well, Arash. great shots of eagles. I see you had a great trip. Was wondering when you went and is this the best time of year to go?? Hi James, Thanks for your comments. I think the best time is from Oct. to Nov.
What a beautiful work!!!! 😀 God’s creation is amazing…..